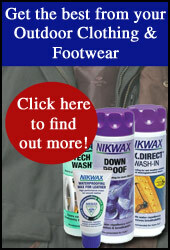 Nikwax waterproofing products will add water repellency back into your clothing and footwear. If your outdoor jacket is dirty and holds water (i.e. the rain doesn't 'bead' off)then its time to clean and reproof. Nikwax waterproofing products can be used in a washing machine for ease and to save time. It is also available as a spray-on so that troubled areas such as on the shouldres of the jacket, or the knee area on over-trousers can be coated thoroughly. Or why not use these products when washing by hand - its a versatile product! By maintaining the waterproof capabilities of your clothing, footwear and equipment they will perform better in wet weather, remain breathable and keep you dry, warm and comfortable all day! Look out for the purple cap!